All creatures deserve high quality food to develop optimally. Even birds that fly freely in the skies above us deserve more than mere scraps, wild fruits, and seeds that may be laced with pesticides and a whole lot of chemicals. Besides, one cannot deny that the tunes that birds sing are definitely more melodic, more relaxing than the metallic noise created by certain rock bands. No offense. As such, bird feeders are created to allow us to feed free-flying avian species with high quality food without necessarily impeding their sense of freedom. Bird feeders come in different types, shapes, and sizes and have become the centerpiece of any garden whose goal is to serve as a temporary haven for local and migratory birds for the whole family to enjoy. And if you’re thinking of adding a bird feeder in your garden, backyard, lawn, patio, or even in your window, then you’ve come to the right place. We’re your online resource for the best bird feeders to buy in 2019. 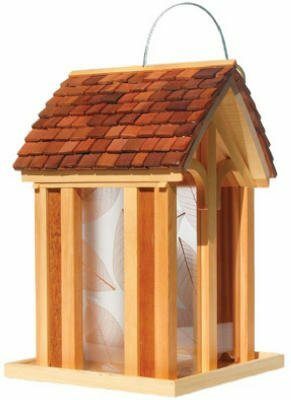 The Nature’s Hangout Window Bird Feeder is perfect for homes that do not have the luxury of a backyard or a garden upon which to install dedicated garden bird feeders. The Nature’s Hangout is made of highly durable acrylic that has been further strengthened to make it scratch-resistant. It comes with a dual compartment so you can place as much as 4 cups of your favorite bird seeds into its feeding tray. The trays come with built-in drain holes to keep the seeds from getting moist and prevent the growth of molds. Mounting the Nature’s Hangout is quite easy, too, thanks to the inclusion of 3 powerful suction cups at the back panel. At any rate, since this bird feeder doesn’t come with any ornament that can obstruct the view, you’d be treated to a variety of birds feasting on the treats you provided them. 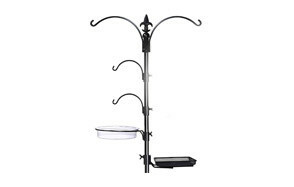 If you prefer a smaller yet fully functional avian nutrition device, then get the HF92 Gazebo Wild Bird Feeder. This product from Perky-Pet makes for a very interesting landscape element in your backyard especially if you already have a gazebo in place. The visually pleasing angles and balanced lines of the Perky-Pet Gazebo can really add beauty and charm to any outdoor landscape. The hexagonal shape of the Perky-Pet Gazebo provides a feeding system for a greater number of your feathered pals as they perch on the wraparound tray. The twist lock cap helps ensure the safety of your bird seeds so only avian species will be able to access it. Moreover, the angled roof provide additional protection against the elements so your seeds stay fresh until next refill. Cleaning should be done at least twice a week, nonetheless, to help ensure the overall safety of the entire system. Nature Gear is uncannily similar to the window bird feeder from Nature’s Hangout. There are only a couple of differences, though. First, Nature Gear comes with an extended roof to help protect birds from a sudden drizzle while also providing some degree of protection for the seeds placed in the Nature Gear’s dual feeding tray compartment system. Additionally, Nature Gear also comes with 4 suction cups compared to the 3 on Nature’s Hangout. Would it be safe to assume that 4 suction cups will provide a stronger attachment to your window glass? 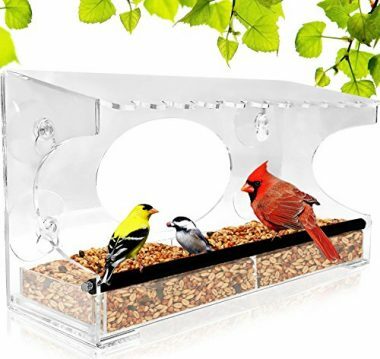 They both have the same 4-cup maximum seed capacity, built-in drain holes in the feeding tray, and a clear transparent design of the bird feeder. Oh, there’s one more difference. Nature Gear is about $15 cheaper than Nature’s Hangout. We’re not sure if this matters, but if you’re on a budget, we’d say it does. 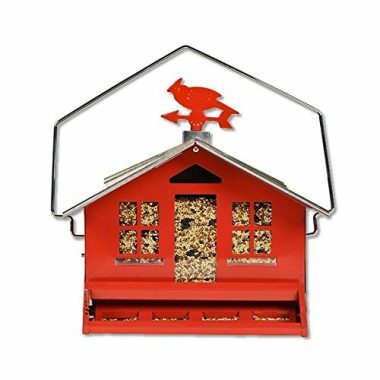 If you’re on the lookout for an avian feeding structure that resembles a bird house, then you’ll find Perky-Pet’s Squirrel Be Gone II Country House Bird Feeder with Weathervane to your liking. Not only will it look good in your backyard, the Country House will also provide you with more space as it is fully capable of holding up to 8 pounds of various seeds. No matter what kind of bird food you’ll put inside this colorful bird house style of feeder, it sure can accommodate it. The Country House comes with a removable roof for easy feed refills while a lock mechanism secures it in place. There are 4 feeding stations complete with fully adjustable spring mechanisms to keep the feed safe from foraging critters. It’s quite easy to clean, too. The Holly Berry Gilded Chalet Wild Bird Feeder is an exceptional choice for households that are adorned with many antique stuff. The look of the Holly Berry makes it a very elegant décor, resembling one of those circular street lamps that come with a half-dome shaped cover, finished in antique gold. The seed compartment can only be accessed from the top which is secured by a sure lock cap system. The circular tray that doubles as a perch allows for multiple birds to feed on the 2-pound seeds inside the canister. Don’t be fooled, though as the Holly Berry canister is made of plastic, not glass. Nevertheless, you can be sure it’s quite tough. The Squirrel Buster Classic is a cheaper version of the SB Plus also made by Brome. 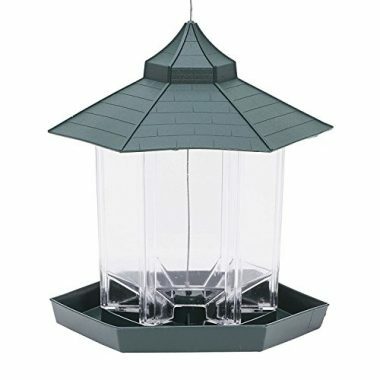 The Classic is just like many metal bird feeders that come with a metal cage frame enclosing the seed canister in the middle. Unlike the SB Plus, however, the Classic doesn’t feature a cardinal ring or perch. Instead, it comes with 4 feeding ports, each one with its own anti-squirrel closing mechanism. The frame and other exposed parts are also constructed of durable, UV-stabilized, rustproof, and waterproof materials, particularly the RoxResin technology. They don’t call this the squirrel buster for nothing. 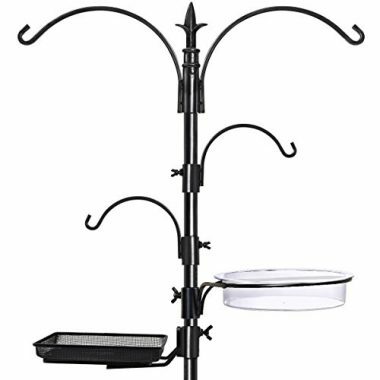 We decided to include the GrayBunny bird feeder pole in this list since there are quite a number of households that may not have trees or other structures upon which to hang or mount their metal bird feeders. While a window bird feeder may be advisable, using the Premium Bird Feeding Station Kit makes more sense. You only need to stake it to the ground and attach a variety of bird feeder systems into its adjustable hook attachments. 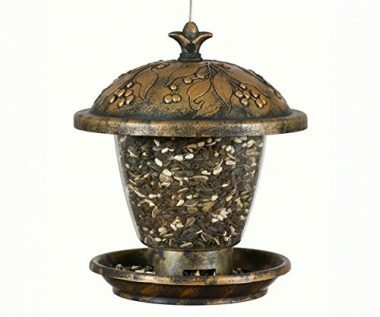 You can place any of the metal bird feeders we have mentioned in this review. There are also a feeding tray and a water dish attached to the bird feeder pole so avian species can have a great time taking a much-needed bath or drink. The GrayBunny is a great choice if you want to centralize the location of your avian feeding stations. We’d say this bird house from Perky-Pet looks a lot more natural than the company’s Country House variant. It may only hold 3.6 pounds of bird seeds, but it sure looks more appropriate in your garden since it comes with a wood thatched roof. The seed compartment is transparent so you can easily determine if your feathered friends need some refilling of their foodstuff or not. 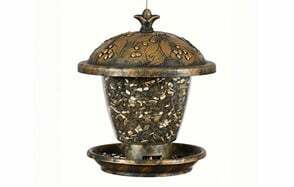 It is also relatively less expensive than the other garden bird feeders we have in this list, making it a viable option for those who are on a tight budget but are looking for something functional and elegant at the same time. If you have already decided to add a bird feeder to your garden or even attach one on your window, you’ll find that you have plenty of options to choose from. 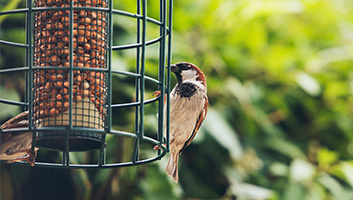 While picking the right bird feeder system is crucial, equally important is your understanding of the different foods that these Mother Nature’s creatures feed on. This will help you better decide on the best avian feeding system to have in your home. Why Buy a Bird Feeder? There really is no other reason for buying a bird feeder than to contribute to the welfare and the long-term health of birds in the wild. Being in the wild may equate to being free. But this also means being exposed to a lot of danger from other birds and animals that are higher in the food chain. Most of the time, man’s activities have made wild birds’ source of food even more dangerous as chemicals are typically used in many of the foods that wild birds consume. There is stiff competition in the great outdoors. Squirrels, bears, deer, and other animals will also forage for the same food that birds subsist on. Providing these wild feathered creatures high quality food that only they can have access to underscores the importance of providing bird feeders in certain areas of our gardened homes. If you look at the market today you’d be greeted to a dizzying array of different types of bird feeders. The thing is that each one of these types is specifically intended to provide feed to birds that display a particular feeding behavior. For instance, if you’re looking to attract ground-feeding avian species, then a bird feeder that can be set on the ground or one with a low tray would be appropriate. Let us take a closer look at the different types of bird feeders. Platform feeders – these are perfect for pigeons, grosbeaks, sparrows, starlings, jays, doves, blackbirds, and juncos. These don’t provide protection against snow, rain, and even bird droppings. The best platforms are those with ample drainage at the bottom. The issue with these types of feeders is that the seed is an open invitation to almost any other creature that loves seeds. House feeders – also known as hoppers, these are attractive to finches, cardinals, grosbeaks, chickadees, jays, buntings, sparrows, titmice, and other feeder birds. Sadly, these are also magnets for squirrels. You will need a squirrel baffle to keep these out. The seeds contained in these types of feeding devices can last a few days so you don’t have to replace it every now and then. Window feeders – these are excellent for viewing birds feeding up close and personal. 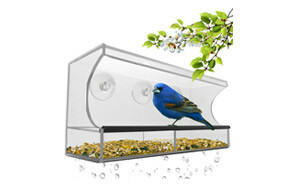 These can be easily mounted on almost any nonporous surface but are ideally installed against glass windows to allow for unobstructed viewing of the birds while they’re feeding. These are easily accessible and are easy to clean, too, and have become the favorite of chickadees, finches, and titmice. Tube feeders – as the name implies, these are hollow cylindrical tubes that can help protect and secure the seeds inside from the weather as well as from foraging creatures like squirrels. 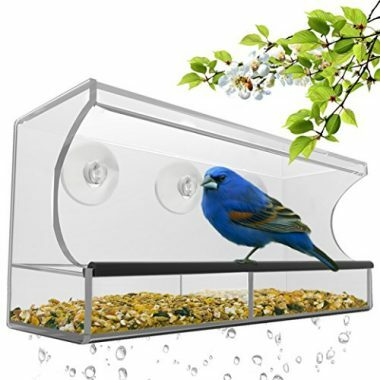 These have feeding ports that come with weight activated closing mechanisms to keep out any bird species or other animals that is heavier than the designed weight of the tension spring. These are magnets for sparrows, titmice, finches, chickadees, and grosbeaks. Heavier bird species like jays and grackles typically won’t feed on such systems. The only downside of this type of avian feeding system is that seeds tend to collect at the bottom just below the line of the feeding port. This can become the perfect breeding ground for microorganisms. As such, emptying the tube feeder is important prior to replacing the feed. Nyjer feeders – these are designed primarily for American goldfinches, common redpolls, and pine skiskins as they are known to be especially fond with thistles or Nyjer seeds. These are available in two forms – thistle socks and tube feeders. Suet feeders – this type of avian feeding system is very simple, as simple as a platform or tray feeder. These are mostly made of wire mesh. In some cases, mesh onion bag will do. These are nailed to a trunk, suspended, or even mounted to a hopper feeder. These are magnets for woodpeckers, starlings, chickadees, nuthatches, jays, and titmice. Which Foods Attract Which Birds? One of the most crucial aspects of feeding birds is knowing which foods will naturally attract which birds. Unlike other pets that can subsist in a more generalized kind of sustenance, birds will require different foods depending on their unique characteristics especially their size. You simply cannot expect a very small bird to be chowing down on a corn kernel, can you? So, which foods will attract which birds? Let’s find out. Fruits – These remain the favorite of a great number of bird species. Males generally love fruits because certain flavonoids found in fruits help enhance their colors, a natural trait used in courtship displays. Robins, parakeets, chlorophonias, tanagers, waxwings, and hornbills are just some of the many avian species that love fruits. Nectar – The hummingbird is best known for its love for nectar. Other bird species that thrive on this juicy treat include the bananaquit, sunbird, myzomela, flowerpiecer, thrasher, and the sicklebill. Insects – A great number of birds feast on insects as their principal source of proteins. They simply cannot get this from eating fruits and sipping nectar. They need protein to help build their muscles to flap their wings, too. Woodpeckers, kestrels, swallows, kingfishers, cuckoos, drongos, and sparrows are just some of the bird species that love feasting on insects. Worms – Not all birds eat worms, but there are certainly those that treat these wriggly creatures as delicacies. The American robin and the black-bellied plover are both known to have a knack for earthworms. The same is true for the black-tailed godwit, the short-billed dowitcher, and the killdeer, just to name a few. Fish – Long before the invention of the fish sonar, coastal fishermen relied on birds to determine where the schools of fishes are so they can drop their net and haul in a hefty bounty. Birds are known to skim the water’s surface, steal fish from nets, or even spear the fish with their beaks. Most have developed an innate talent for plunge diving and surface diving to hunt for fish. The point is that the shape of their beaks ultimately determined whether they are especially adapted for hunting creatures of the deep or not. The African fish-eagle, American dipper, anhinga, Atlantic puffin, bald eagle, common tern, double-crested cormorant, the osprey, and the gulls are just some of the bird species that have developed their skill for hunting fish. Amphibians – Frogs and other amphibians, it would seem, are quite delectable to the African pygmy kingfisher, black-crowned night heron, blacksmith lapwing, and the common greenshank. Other bird species are known to have a natural tendency to devour on frogs and other amphibians. Reptiles – Have you seen birds preying on reptiles? While we’re not talking about crocs and gators here, there are birds that love smaller reptiles. They include the black vulture, crested caracara, ferruginous pygmy-owl, great blue heron, and the greater roadrunner, just to name a few. Other birds – There are birds that love nothing else than to feed on other birds, typically those lower in the food chain. Examples of these are the falcons, hawks, African finfoot, American kestrel, and the cattle egret, among others. Mammals – Some bird species like the barn owl prefer live, kicking mammals as their favorite dinner. Aside from owls, other mammal-eating birds include the buzzard, the eastern screech-owl, the northern harrier, and the red-billed hornbill. Carrions – These birds love feeding on carcasses. Examples are the American crow, black vulture, common crow, raven, and the golden eagle. Eggs – Did you know that eggs are an excellent source of nutrition for our avian friends? It doesn’t really matter what kind of egg it is, but many birds sure love feeding on eggs. Examples of these birds are the American dipper, the Boat-tailed grackle, the Hood mockingbird, the laughing gull, and the Laysan finch, to name a few. The following are what birds will normally feed in the wild. But of course you cannot expect to put carcass into your bird feeder. The only feed types that you can place in these gadgets are seeds, also called bird seeds. As such, we’ve decided to come up with a separate list of which seeds will attract which birds. Sunflower seeds – you can say that sunflower seeds are the best all-around feed for almost any type of bird. Unfortunately, squirrels love sunflower seeds, too. As such, your choice of bird feeder should help keep these creatures from gaining access into the feed. Safflower seeds – this is a favorite of cardinals as well as doves, chickadees, native sparrows, and grosbeaks. They’re quite tough to crack and most house sparrows, squirrels, and European starlings don’t like it. Thistle or Nyjer – these are the favorite of small finches. White proso millet – quails, doves, cardinals, American sparrows, towhees, and juncos. These are the favorite of house sparrows and cowbirds, too. If you do decide to use millet, make sure to use low tray feeders. Corn, shelled or cracked – grouse, quails, cardinals, crows, jays, doves, pheasants, turkeys, ducks, cranes, ravens, and grosbeaks. Sadly, they’re a favorite by bears, deer, raccoons, house sparrows, and cowbirds, too. What’s more, corn is most likely contaminated with aflatoxin. Avoid dyed corn or buttered popcorn or any type of corn that is intended for farming. Peanuts – crows, titmice, chickadees, jays, and woodpeckers. These are favorites of bears, squirrels, and raccoons, too. They are quite prone to harboring aflatoxins. As such, peanuts should be kept dry and be used pretty quickly. Sorghum or milo – Steller’s jays, Gambel’s quails, curved-bill thrashers, cowbirds, and other ground-feeding species. These can be placed in low tray feeders. Canary seeds and rapeseed – quails, finches, juncos, doves, house sparrows, and cowbirds. Most folks don’t like to invite the last two bird species so these seeds are not often used. Whether it is a simple platform feeder or a more sophisticated tube feeding system, the important thing is for you to truly understand the need for such systems. The sense of being able to provide good quality food for some of Mother Nature’s creatures should be the primary motivation for picking and buying the right one.